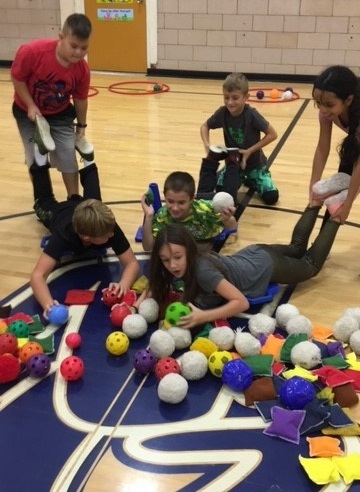 My name is Bart Jones and I am an Elementary Physical Education teacher at Van Meter Elementary in Van Meter, Iowa. The activity I modified/created/shared is called “Jenga Fitness”. I created my version of this activity in response to the many indoor recesses my students have due to the unpredictable Iowa weather. I saw on social media that others were modifying traditional board games to include more movement and I thought Jenga would be a perfect fit. My version includes coloring the ends of the Jenga pieces (instead of writing directly on the pieces). I felt not writing on them allowed for more versatility in ways the Jenga game could be used. This activity incorporates cooperation, counting/addition, balance, muscular strength, and flexibility. I feel that this activity is best suited from elementary aged students but can be modified for middle school students too. *as an alternative to coloring your own Jenga blocks, you can also use our patriotic version that come with 3 colors. You can also write on these with permanent markers. Color the ends of each wooden block. Spread 6 hula hoops around the classroom. 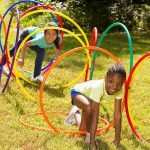 Set up the following in each hula hoop: 1 set of wooden blocks, 1-2 foam dice, and the age appropriate fitness sheet. 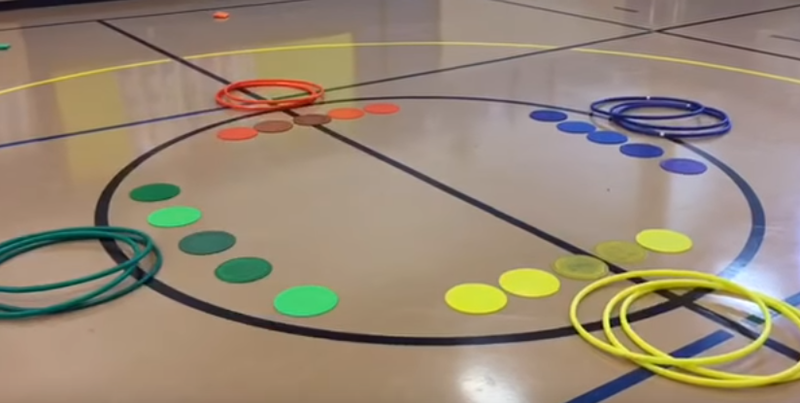 Divide the students up evenly among the 6 hula hoop sets. The order of rolls can be determined by height, age, etc. The sky is the limit. The first person chooses a wooden block from the stack, removes it, and places it on top of the stack perpendicular. Once the block is placed on top, the student remembers the color on the side of the block (which corresponds to a specific exercise) and then they roll the dice. The total number of dots indicated on the die tell the students how long, or how may repetitions, to perform the color coated activity (see included pics). Once the chosen exercise is performed by all students, the next student chooses a wooden block, places it on top, and rolls the dice. The activity continues until the tower of blocks falls or time is up. 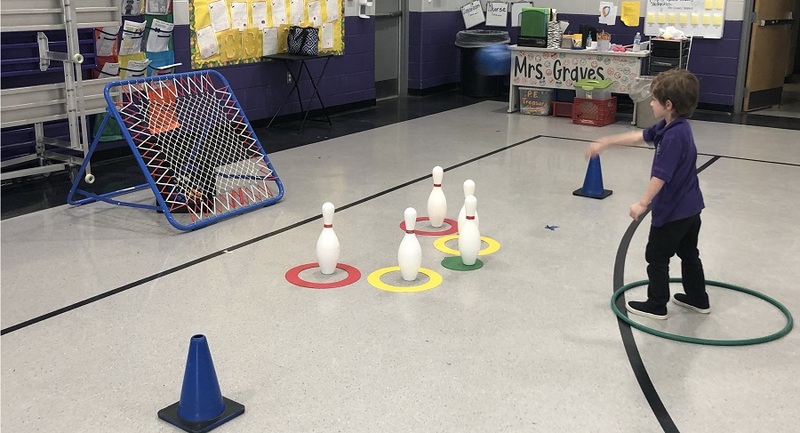 My students reacted very well to the activity as many were excited to see an activity they might have played at home in PE class! 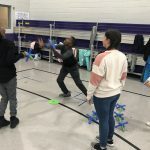 Many said they enjoyed working with others in the class, learning how to many their bodies healthier, and choosing the wooden block to move in hopes the tower didn’t fall. Use multiplication instead of addition for total reps / length of time. Bart Jones was born and raised in the great stat of Iowa where he graduated from Iowa State University in 2003 with B.S. in Exercise and Sport Science and from A.T. Still University in 2012 with M.S. in Human Movement. Brat is currently in his 16 year of teaching (14th at Van Meter) and was fortunate to earn the 2015 Iowa AHPERD Elementary PE Teacher of Year. Bart is married with 3 kids, Gabe (11 yrs. ), Noah (8 yrs. ), & Phoebe (5 yrs.) and enjoys being active indoors and out. He likes watching movies, reading books, coaching his kids in sports, and listening to music. 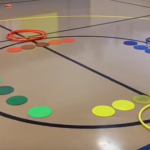 This entry was posted in Active Play, Featured PE Teacher, Hula Hoop, PE Central and tagged Bart Jones, fitness activity, Fitness Jenga, jenga activity, PE games, PE lesson plan, physed, Physical Education by S&S Worldwide. Bookmark the permalink.